"Full review about what's Hot, Hip, and Hit in the fashion industry." 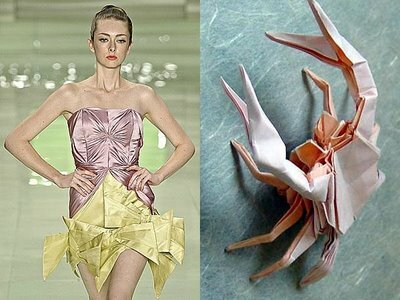 Even long before fashion designers add origami touch to their designs. 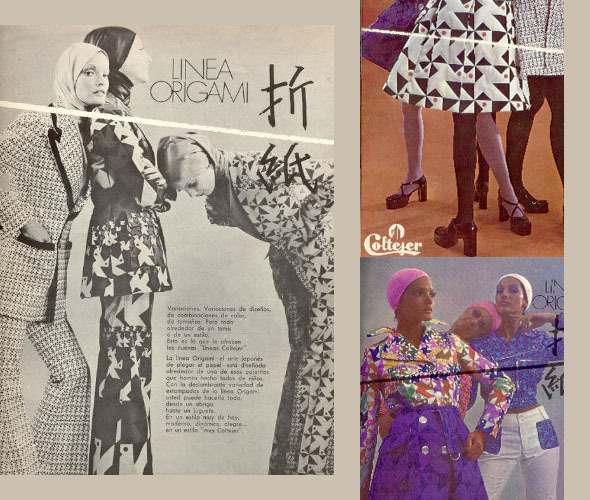 The Coltejer fabric company in Colombia produced a line called "Linea Origami" in 1973. The ads stated. "The Origami line -The Japanese art of folding paper - is designed based on one of those paper models those we folded when we were children. 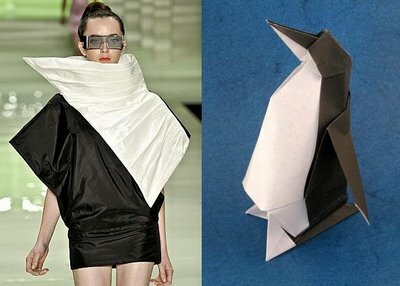 With a stunning variety of patterns of the Origami line you can do anything, from a coat to a toy. In a style from today, very modern, dynamic, joyful... in a "very Coltejer" style. Back to recent years, precisely in 2008. 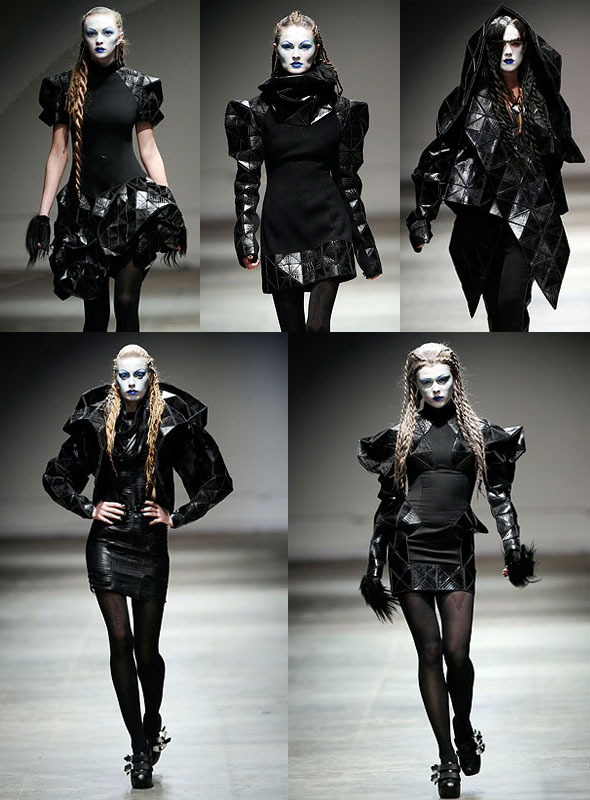 When Gareth Pugh added an origami element to his Fall 2008 collection. 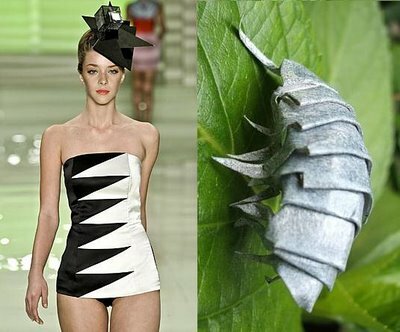 Designer André Lima presented his Spring 2009 collection inspired by geometrical shapes at the Sao Paulo Fashion Week. 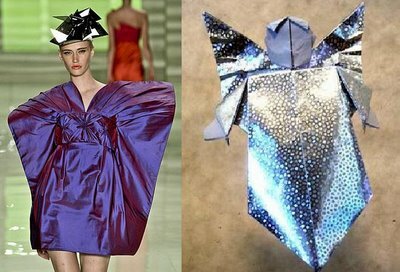 Trenddelacreme spotted striking resemblance between these dresses and origami classics. 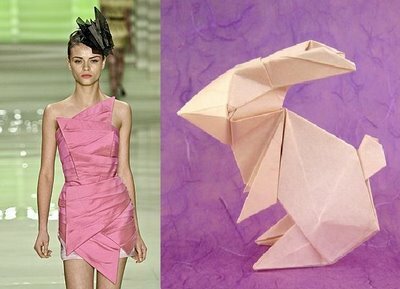 For Spring/Summer 2010 collection, Marchesa gave a touch of origami technique to their beautiful dresses. Enter the work of stylist and art director Petra Storrs. 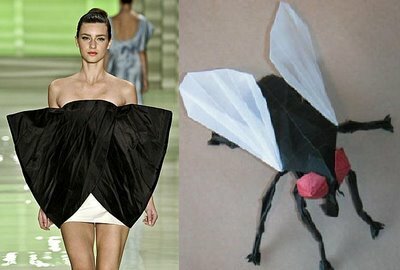 Which origami seems to be her main inspiration for these paper outfits. Petra Storrs has created many charming paper props for various photo shoots. 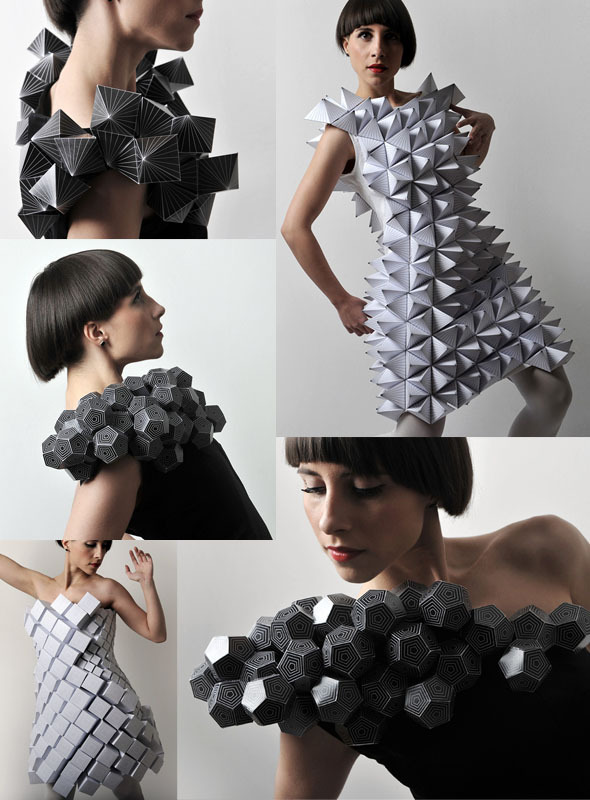 Art & Design research professor, Mauricio Velasquez Posada and his students have created a series of origami dresses. In Feb 2009, this was a student project called "Animorfos" but now it has evolved into "Geomorfos: the body as a metaphor of the geographical". 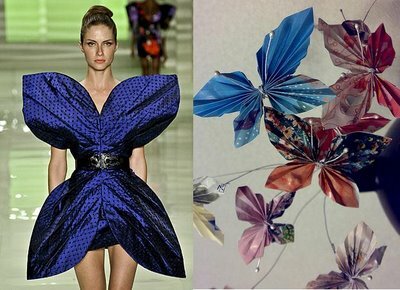 Included here you will find dresses with snapology, kirigami, corrugations, tessellations, Chinese Paper Folding (triangular units), Sonobe units, Enigma Cube, Spikey Star, and more. 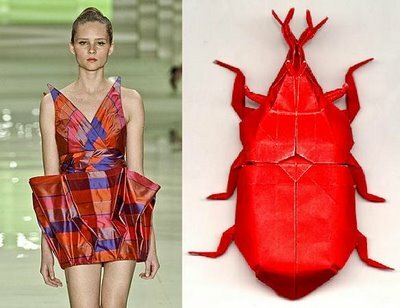 For his line "132 5", Issey Miyake invented a foldable dress that can be flattened into 2 dimensional form. 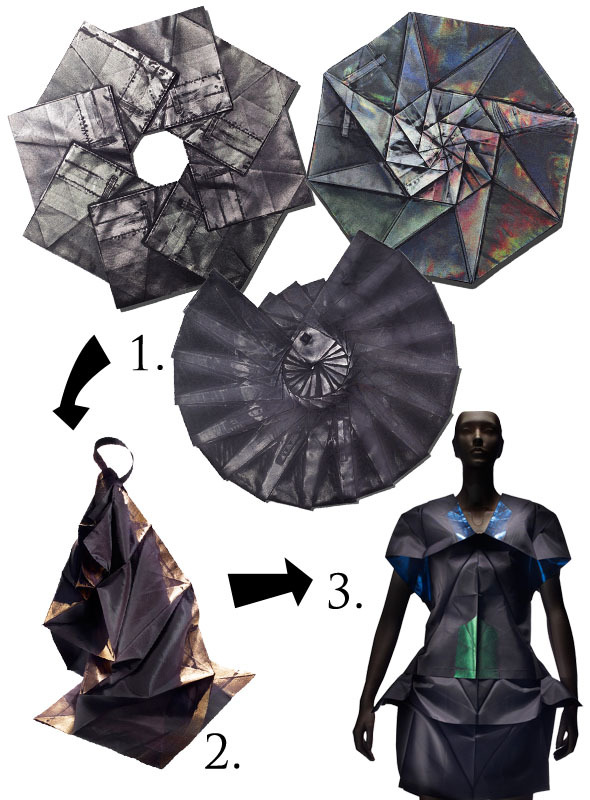 To make an intricate clothing pattern like this one, Issey Miyake using a software program, devised by computer scientist Jun Mitani, that generates intricate three-dimensional shapes from a single flat sheet of paper. 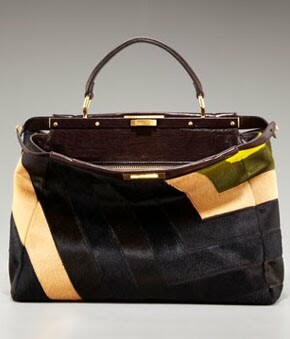 It’s this multidisciplinary process that lends the collection its name. The number “1″ refers to the single piece of cloth used to make each item, “3″ to indicate its three-dimensional shape, and “2″ to the fact that it can be flattened two-dimensionally. The single space denotes the time between the completion of the folded form and the moment someone puts it on, while “5″ signifies the concept’s multiple permutations. 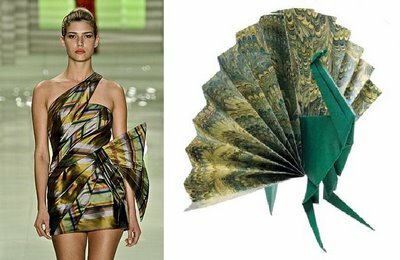 Amila Hrustic, Academy of Fine Arts student at the University of Sarajevo, designs origami-inspired dresses made of paper and textiles. 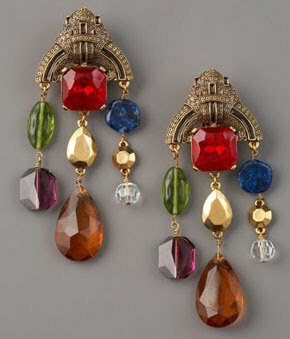 The collection itself called "Plato's Collection". 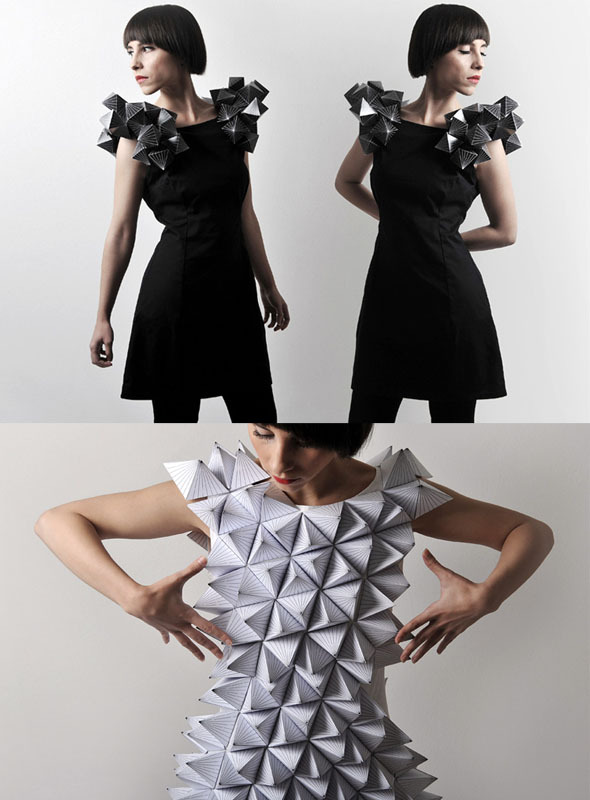 Designer, Ester Celluci made an origami dress in traditional tuscany casentino wool. Want a Styling Fairy of Your Own? Up to a 100 style inspiration every week. Free! Keumala & Reunata Poetri — are sisters who have lifelong passion for fashion and dedicated this blog to all fashion-lovers out there. As fashion consultants, their desire is to inspire as many women as possible through information and inspiration from the fashion world to help them observe what kind of personal style that really suits them. Because they have a strong belief that every woman is beautiful thus could look and feel fabulous if they can find their own specific style based on their personality.